We welcome you to the second part of our special blog series on email marketing. 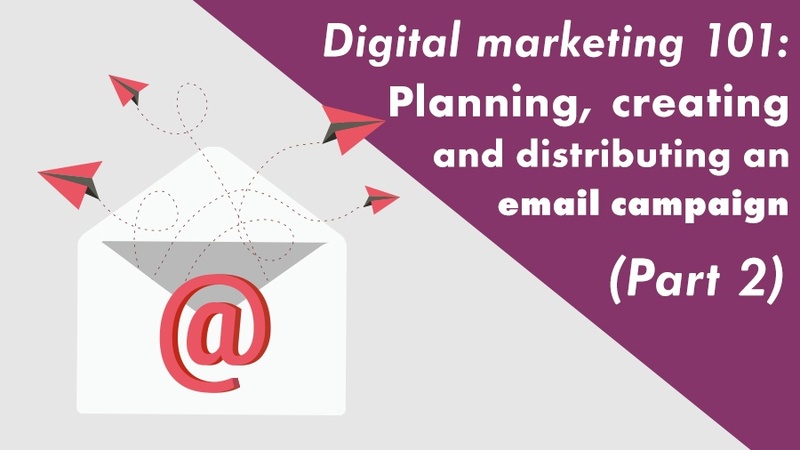 Let's explore planning, creating and distributing your first email marketing campaign. Furthermore, in this blog post, we will provide you with all the guidance to launch a successful email campaign (a collection of email newsletters with a common goal). Setting goals: Determine goals for the campaign and make certain they’re measurable. Align online and offline strategies. Always strive for consistency: When planning the design and layout of your email marketing campaign, think about the end result and what your long-term goal is. Keep design and branding consistent across all your digital channels. Timing and frequency: Most of all, understand the lifestyle of your target market before scheduling and sending off an email newsletter. Consider the best time of the day for your target market, perhaps when they’re on lunchbreak or after their work day finishes. Remember to keep to the timing and frequency of the emails you send out. This is very important! How do you start building your email marketing database? Generally, buying email databases or using ones available on the internet is frowned upon. If you have an existing spreadsheet containing existing client emails, this can be added into software provided by an ESP (Email Service Provider). One most noteworthy email service provider is MailChimp. In addition, MailChimp allows you to import already existing contacts and build an email database. If you’re looking for an all-in-one marketing automation platform that can help you to generate new leads, and new email contacts effectively, then HubSpot is a great option. You’ll be building a new email database for your business in no time! Include an opt-out or unsubscribe option on all emails. Identify the source of every contact in your database. Email customers and ask permission to add them to your email marketing database. Add a forward button or sharing buttons to the bottom of your emails. Contact prospects by phone or email and ask if they want to subscribe to your newsletter. Research prospects online, email them and explain to them why you’re contacting them. Be sure that your website has enticing CTAs (Call-to-actions) for newsletter signups. Add a line to your email signature that informs contacts that you’ll be sending updates, news and other information. “From” address: Customers will always look at the “from” email address. Make sure you’re using your company name. A branded email address is essential! Subject line: Your subject line must contain specific details about the email with sufficient incentives for the recipient to open it. Email body text: Copy should be informative, short and to the point. Remember to address the recipient with their real name! Date your emails, be specific with what you write, and think about image placement of images in the email newsletter and keeping designs on-brand. The most valuable content must be placed at the top of the email. It’s key to link back to your website and highly trafficked website pages. Always add an “unsubscribe” or “opt out” link at the bottom of emails. In the next blog post, we’ll conclude this blog post series. In the third and final blog, email marketing distribution is going to be explored. From there, you can start putting together your own email marketing campaigns!